Doris Roberts was an American actress, author, and philanthropist whose career spanned six decades of television. She appeared as a guest on many talk and variety shows, along with appearing as a panelist on several game shows. She was an advocate of animal rights and animal-rights activism, supporting groups such as the United Activists for Animal Rights. 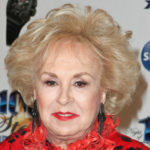 Doris Roberts also studied acting at The Neighborhood Playhouse School of the Theatre in New York City.